This disgusting attempt to gain publicity by injuring the good reputation of Canada and our Prime Minister Harper is totally worthy of condemnation and censure. Typical of what a fifth columnist does to destroy peoples foolish peoples belief in the value of our democracy. Who inspired this? I believe "Allison" is doing the work of Hamas. Posted by Alison at 4:32 am Allison' picture shows her face adverted in shame, she claims to be from Bowen Island, B.C. They should lock that mother-fucker up and throw away the key. Harper has been very busy buying up, ethnic votes and donations. 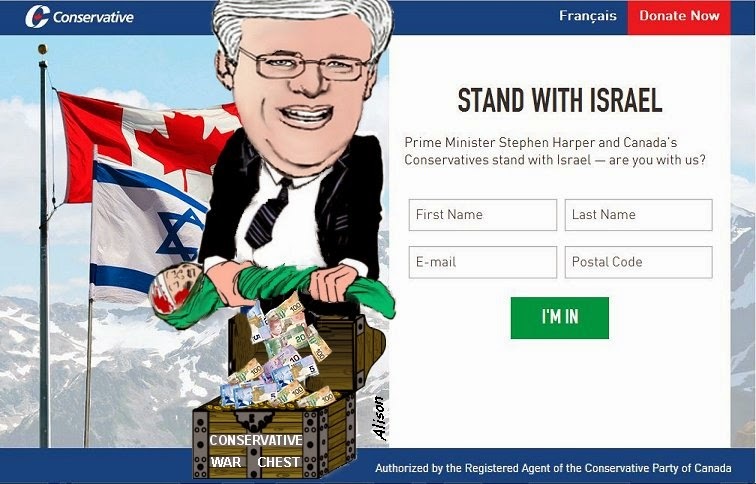 The Jewish people will vote for Harper. The Ukrainians will also vote for Harper. Harper gave Poland, the BC ship building contract. China already owns much of Canada's resources and resource jobs. There are 413,000 Chinese in Vancouver alone, 45,000 more want in. Then there is this. We have known for a long time, Harper has been kissing Chinese butts for votes and donations. Look at the perks the Engineers from India have. Electrical and Electronic Engineers. Canada is calling. Have a look at, all of the jobs, this Ashakiran is recruiting for. Harper will certainly have all of the people from India, voting for him. Harper is pure evil and using every dirty tactic in the book, to stay in office.Harper is absolutely rabid, to be a big shot on the International scene. I had read? Harper is Obama's useful fool. Harper is an old fascist dictator since, his Northern Foundation days of 1989. Harper was the Policy Chief. We also know just who, donated to Harper's Alliance in 2002. People should be very careful, of what they wish for. .. get a grip .. Chris j. Slater .. Letting your hysterical edge show.. doncha know ..
try informed comment instead of rapturewank..
and under what rock have you been hiding .. ? No offense meant.. in Canada ? Ugh, I dislike Conservative conflation errors, like their's is the only perspective out there. You know, like conflating support for the radically militant rightwing of Israeli politics and policies with support for Israelis or the state properly. It's damned in accurate and downright weird in the way that makes you want to scrub with a wire brush. Single-minded simpletons. The caricature is brutal and bound to provoke disgust but we must remind that it is Steve himself who wrings out domestic political advantage from the suffering of innocents on both sides of this unfortunate conflict. I don't know if there's a more appropriate way of illustrating it: the whole thing is horrible, but, from a Canadian POV, our PM's self-serving opportunism is horrible, too. Maybe Adler and Del Mastro will end up as cell-mates, double-bunked. "Adding to the confusion about ARPA’s address is a claim to have an office on Parliament Hill. According to web data company Zoom Info, this lobby’s base can be found in Room 574, Confederation Building at the House of Commons. The phone number provided belongs to MP Dave Van Kesteren (Chatham-Kent-Essex, CPC) and the fax belongs to the PMO. The only way for Zoom Info to present this data is by crawling the internet for places it was listed, and/or if the company entered a business listing itself. This parliamentary location was further confirmed by seven different sources from 2011 to the end of 2013." When will Canadian MPs show this kind of guts?